Looking at the cover of this book, I wasn’t sure what it would be about. I don’t read the back cover or reviews until I’m into reading the book, so I had no idea what it was about. But being a Julie Cantrell book, I knew it had to be good. The story starts off with Amanda chaperoning her daughters class on a field trip, but things turn bad when her daughter’s friend Sarah disappears and couldn’t be found. This throws Amanda and her daughter into a state of depression. This is not an easy book to read. It is so full of emotions and tension that I had to put it down for a while, but then I couldn’t wait to pick it back up because I wanted to find out what would happen to the characters. The Feathered Bone deals with some pretty tough issues, mainly human trafficking. This is an issue I would love to be able to help with in some way because it is so horrifying and downright scary! I appreciate authors such as Ms. Cantrell writing on such issues. My heart ached with each character as they grieved for their classmate. The scenes are so vivid, its like they are real life actions, and I felt drawn into the story as if I was a part of it. Bobby Barnes seems to be what is known as the town drunk who takes his twin sons Matthew and Mark to the mountains one Saturday night. There was an accident that turned Bobby’s world around. It took me a while to get into this book, I’m really not a fan of this type of book, but after reading for a while, it did get interesting. There are a number of characters that make up this story, and they develop well as the story unfolds. This story seems to be one that either you like it or you don’t, so I encourage you to pick up a copy of There Will Be Stars and see what you think. If you enjoy fantasy type books, I think this one would be for you. I received this book from The Fiction Guild to read and review. I was not required to write a positive review. The opinions I have expressed are my own. I am disclosing this in accordance with the Federal Trade Commission’s 16 CFR, Part 55. Cassandra lived a very lonely life because of her illness, not being able to attend school, or even go out an play with other children her age. When she meets little people called Menehune in a dream, her life changed because these little people gave her the ability to read other people’s minds. I felt so bad for Cassandra because she didn’t have the life of a normal child. And then she looses her grandmother, which was even more heartbreaking. The story gets interesting when the Menehune arrives, though at first I wasn’t sure where the story was going. But then as I kept reading, and the story gets into an older Cassandra, it gets more meaningful for me, and I really enjoyed reading it. This is my first book by Barbara Bras, and it was a delight to read. I encourage you to pick up a copy for yourself to read. You will not be disappointed. She’s ready to take on a new challenge. What she doesn’t expect is an old flame. Tia D’Amico is thrilled to move to San Francisco to help her aunt transform an old luxury yacht into an upscale floating restaurant. What’s not to love? Sunset dinner cruises, posh wedding receptions–the possibilities are endless and far more appetizing than staying in a monotonous job in her Podunk hometown. Besides, some of her best memories are tied to San Francisco–especially the memory of Leo Parker, her crush from a long-ago sailing camp. When Leo Parker himself turns out to be the yacht’s captain, Tia is floating on air. But will it all come crashing down around her when she discovers his heart belongs to someone else? Tia D’Amico is more than excited when her aunt calls her to help transform an old luxury yacht into an upscale floating restaurant, but when she arrives in San Francisco she finds out her uncle had a heart attach, and she is pretty much on her own with the inside renovations. Taking care of the outside changes is the new Captain of the Yacht, Leo Parker. Leo and Tia had met ten years ago while she was visiting her aunt and went to a sailing camp. Tia was thrilled to be working with Leo, that is until she finds out he is engaged to a gorgeous young lady. All Summer Long is an adorable romance from one of my favorite authors, Melody Carlson. The characters are sweet, hardworking and loves their families very much. As I was reading, I thought about this being an awesome read for teenagers, the would be able to relate with the characters better than us older folks. But don’t get me wrong, I loved Tia and Leo’s story. Even though they faced ups and downs, it was fun keeping up with the two and what was going on in their lives. I didn’t put this book down but a few times as I read it. If you are looking for an enjoyable, light summer read, this is an awesome book for you. 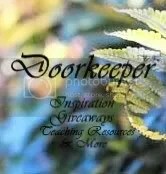 I encourage you to check it out. 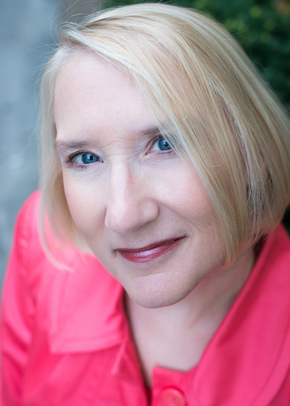 Melody Carlson is the award-winning author of over two hundred books with sales of more than 6.5 million. She received a Romantic Times Career Achievement Award in the inspirational market for her many books, including Finding Alice. She and her husband live in central Oregon. Learn more at http://www.melodycarlson.com. When Prosperity’s mother passed away, she was along, with not a lot of money. So, she decides to use what money she had to go to Key West where her fiancée was hoping for a happier life being with someone she knows. But what she didn’t except was to surprise David, and find the shock of her life that the love she thought she had was married to another. He had moved on, leaving her with nothing! David is really a jerk, to put it nicely. He deserved a lot more that he rec’d because of what he did. I felt so bad for Prosperity, not knowing anyone. It’s when she meets a very kind Dr. that things starting looking up for her. Christine Johnson writes a wonderful and compelling story that will take you through a situation that no one should have to go through. But life happens, and Ms. Johnson does an amazing job of creating characters and developing their lives in a way that makes the story so realistic, it feels like reading a real life story. There was a lot going on in Honor Redeemed, and emotions flying everywhere, but through it all, God’s love, grace, forgiveness and redemption was so plain and clear. And that was so encouraging to me. Because God can take the horrible things in our lives and make something good and wonderful from them. I encourage you to pick up a copy of this wonderful book for a few hours of joy and entertainment.I received this book from Litfuse to read and review. I was not required to write a positive review. The opinions I have expressed are my own. I am disclosing this in accordance with the Federal Trade Commission’s 16 CFR, Part 57. 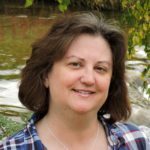 Christine Johnson is the author of several books for Steeple Hill and Love Inspired and has been twice named a finalist for Romance Writers of America’s Golden Heart® award. When not writing, she loves to hike and explore God’s majestic creation. These days, she and her husband, a Great Lakes ship pilot, split their time between northern Michigan and the Florida Keys. This was an interesting read, being this is election year! Leta Breckenridge lands a excellent paying job at a public relations firm. What Leta didn’t know is that she would be used in ways that were very uncomfortable for her. Nathan Emerson may be in the next running race for governor of Texas, and he has just the right woman by his side to make his running complete. But then he meets Leta, and she is so different from anyone he’s ever met before. But two very different lifestyles at this point in Nathan’s life? I have grown to love books written by Kellie Coates Gilbert, and each book keeps getting better. Ms. Gilbert develops characters that are so very realistic and believable. As I read everything going on in this book, I had to ask myself; Does this really happen in real life? And I’m afraid my answer leans more toward yes that anything else. This story shows that lying, cheating, deceitfulness, always comes back to bite you. I also loved the relationship Leta had with her mom. Even though her mom didn’t know how she was most of the time, Leta still needed her mom and they were so sweet together. I hope I have said enough to want you to read this book. I don’t want to give away any of the story, for me it ruins it when someone does that. I strongly encourage you to pick up a copy of this book and read it. You will not be disappointed in this one. Or anything this author writes! Kellie Coates Gilbert is a former legal investigator and trial paralegal, and the author of A Woman of Fortune and Where Rivers Part. Gilbert crafts her emotionally charged stories about women in life-changing circumstances in Dallas, Texas, where she lives with her husband. Learn more at http://www.kelliecoatesgilbert.com. Christy Award-winning and bestselling author Lisa Harris puts you right into the action in this fast-paced thriller. I am so much enjoying this series by Lisa Harris! The first book, Vendetta was a fast pace thriller that kept me on my toes the entire time I was reading it. And this second book, Missing is just as good, if not better. Missing Persons Special Task Force Agent Nikki Boyd is again tangled into a web of dangerous people that will do anything, including taking the lives of people that might disclose their secrets. And of course millions and millions of dollars is at stake. Nikki’s friend Tyler is pulled into the tangle as well. Tyler is the husband of Nikki’s friend who lost her life in the first book. Nikki and Tyler seem to spend a lot of time together with Tyler and Katie’s son Liam, and even though Nikki would love to have more than a friendly relationship with Tyler, he has no interest in dating anyone until he can make peace with losing his wife Katie. 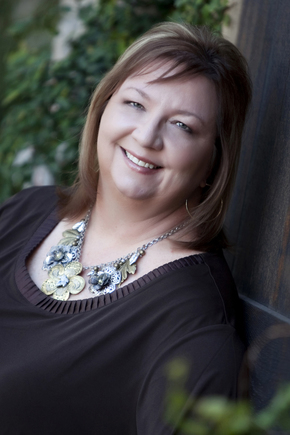 Lisa Harris is a bestselling author, a Christy Award winner, and the winner of the Best Inspirational Suspense Novel for 2011 from Romantic Times. She has sold over thirty novels and novella collections. 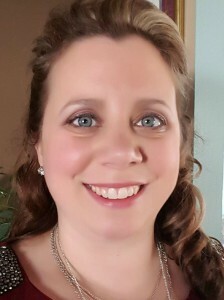 Along with her husband, she and her three children have spent over ten years living as missionaries in Africa where she homeschools, leads a women’s group, and runs a nonprofit organization that works alongside their church-planting ministry. The ECHO Project works in southern Africa promoting Education, Compassion, Health, and Opportunity and is a way for her to “speak up for those who cannot speak for themselves . . . the poor and helpless, and see that they get justice” (Proverbs 31:8). When she’s not working, she loves hanging out with her family, cooking different ethnic dishes, photography, and heading into the African bush on safari. For more information about her books and life in Africa, visit her website at http://www.lisaharriswrites.com or her blog at http://myblogintheheartofafrica.blogspot.com. For more information about The ECHO Project, please visit http://www.theECHOproject.org. Phoebe Von Bergen was so excited that she was going on her first trip to America with her father, but little did she know that this trip would change her life forever. As the story unfolds, so does the tension and dangers surrounding Phoebe’s life. And digging into family secrets enhances the dangers even further. Phoebe soon finds out that her father’s trip to America is more than just purchasing Sapphires for someone. This is a story full of emotions and tension. Add to that the lies and secrets, deception and suspense and you have a wonderful and intriguing story written by author Tracie Peterson. The characters were believable and realistic and full of life. As the story develops the more intense it gets, and the more I couldn’t put it down. This is one of those books that I pick up and read until its finished. Even though we know who is doing what in the story, I kept wondering how it would end, and I didn’t figure this one out. The ending was pretty amazing. And that’s really all I want to say about this book. I hate giving away the plot, and if please watch when reading the review if you don’t want to know what happens. Please scroll to the end for giveaway info. Tossed into the role of rescuer, + must face his past before the whole world falls apart. While he fights to contain the beast around him, he finds his steadfast control slipping through his fingers. And life…everyone’s life…hangs by a thread…once again. 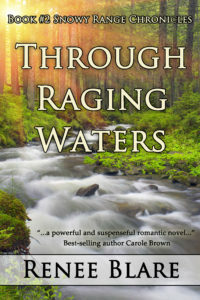 Through Raging Waters is the second book in the Snowy Range Chronicles Series by Renee Blare. Though I read this book for the book tour, I also read Ms. Blare’s first book, To Soar on Eagle’s Wings. Please scroll down to the end of this post for the review of this first book. Melting snow caused by heavy rains is causing very dangerous flooding conditions in the small town of Timber Springs. While local pharmacist Paul Fitzgerald is there to rescue the people of Timber Springs, he is also battling with a trouble past that he needs to come to terms with. Meanwhile, Melissa Hampton discovers disturbing information about her past but must put her mind to rescuing their small town first. Will two troubled people be able to save themselves and their small town? I enjoyed reading Through Raging Waters, and though it can be read as a stand alone, it will benefit you to read the first book too. Through Raging Waters has so many characters, I found it easier to keep up with them because I had read book one. A lot happens in this book, the people of Timber Springs face a number of tragedies. It is sure a fast pace, action packed story. I encourage you to check out this sweet romance, and don’t forget to look for book one in the series as well. 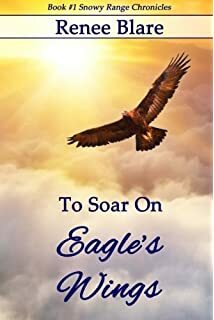 In ‘To Soar on Eagle’s Wings’ Rachel meets up with her brothers old roommate, Steve, and she is reminded of the crush she still has for him. Steve is the new game warden in the area and Rachel loves the outdoors and nature, so their paths are sure to cross in this small town. Steve and Rachel are delightful characters, and I enjoyed their story. Though life wasn’t always easy for them, there were a lot of ups and downs, Ms. Blare does a nice job of keeping the story fast pace and interesting, keeping me interested in what was going to happen next. Rachel’s life is so much like that of the younger ladies in my family, liking the wildlife and the outdoors, I felt I could relate to her in a lot of ways. This is a fun and enjoyable story, one that I encourage you to read. And don’t forget the check out the second book in this series, Through Raging Waters. This book was provided to me by the author in exchange for my review. The opinions in this review are mine only. 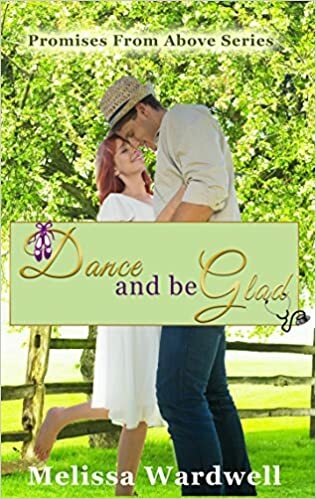 Dance and Be Glad follows two other books, of which I understand reading those two first would help understand this book better. 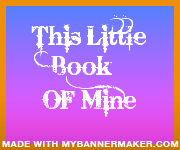 But for me it was a really nice read as a stand alone. Jillian Matthews doesn’t have life very easy. The stress and emotions of being a widowed mom, taking care of her dance studio and her daughter doesn’t leave a lot of time for anything else or anyone else. Dr. Michael Emerson was happy with his life as an ER doctor and mission work, leaving him no room for anyone else in his life. But then the two meet up again. 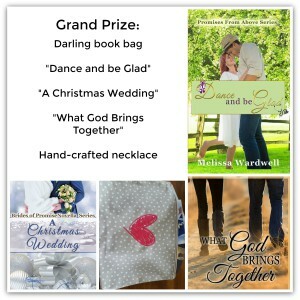 Melissa Wardwell writes a sweet romance that deals with issues people face every day. The death of a spouse, a messy divorce, throwing all of your time and energy into starting life over after your former life is ripped out from under you. Facing stressful situations and emotions that you don’t want to deal with. But then life can change, just as it does for these two characters. 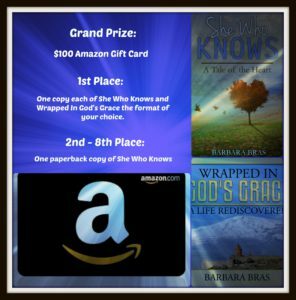 I enjoyed the way Ms. Wardwell develops interesting and intriguing characters that make the story fun and entertaining, and also shows that God can change out circumstances. This is truly a story of love, forgiveness and second chances. If you are looking for a nice, clean and fun summer read, I recommend Dance and Be Glad for you.